In his 1999 novel Survivor, Chuck Palahniuk wrote, “There is no free will. There are no variables. There is only the inevitable.” Granted, that was satire, but in the car world, few events are as inevitable, and almost boringly variable-less, as the cadence of new Porsche 911s. While purists might argue Porsche, at times, has updated the 911 against their will, history suggests the new version will, inevitably, be good to drive. The cycle resets again for model year 2020, as predictable as a fist fight in the Ukrainian parliament. 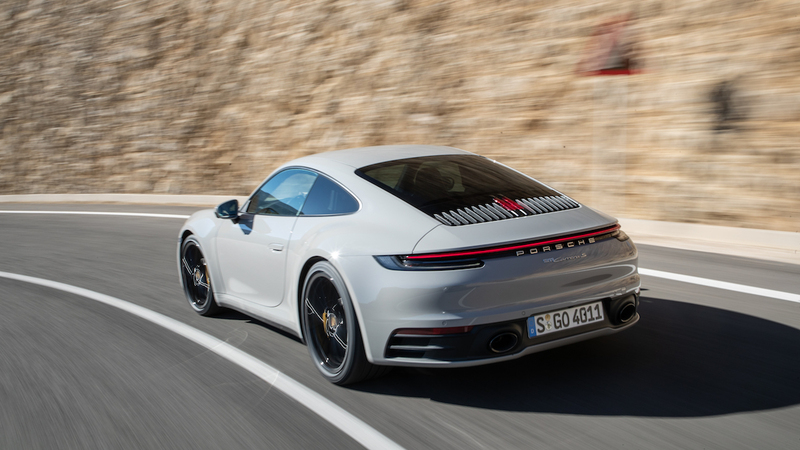 The 992.1 is the eighth all-new 911 since the model’s birth in 1963, not including momentous mid-cycle updates like the 991.2’s controversial turbochargers. Similarly, in a few years’ time, it’s likely the 992.2 will break new ground by adding a hybrid-electric powertrain; there’s already a blank space in the transmission housing where the torque-fill motor will fit. 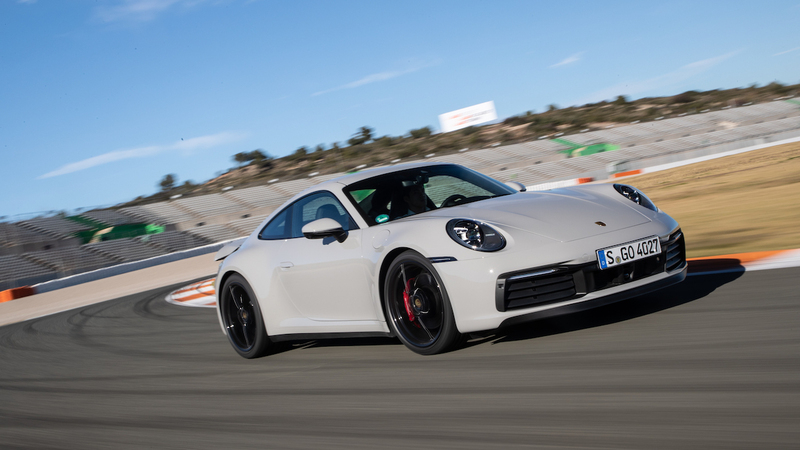 For the global 911 launch, Porsche flew members of the media to Valencia, Spain for a test day that included 90 minutes of drive time on the road, six laps around the Ricardo Tormo MotoGP circuit, and a few turns on a wet-handling course to show off the 911’s new “Wet Mode.” It’s not a lot to go on—but the 911’s new build is incremental, the baseline is well known, and the 911 immediately feels as familiar as it looks. This new 911 may not break new visual ground, but there are some big upgrades under its skin. It’s more powerful and quicker, with a broader set of skills, greater technological fitness, and more adaptable aerodynamics. Notwithstanding a weak rear-end treatment laid out to comport with the company’s other vehicles, the 992 is more handsome, as well. With 24 flavors of 911 crowding Porsche dealerships, the 992’s influence will resonate for years to come, so it’s important to get the Carrera right. Each new 911 generation has been more stable under acceleration, braking, and cornering—thus easier for civilians to drive—than the last, and this one doesn’t break with tradition. 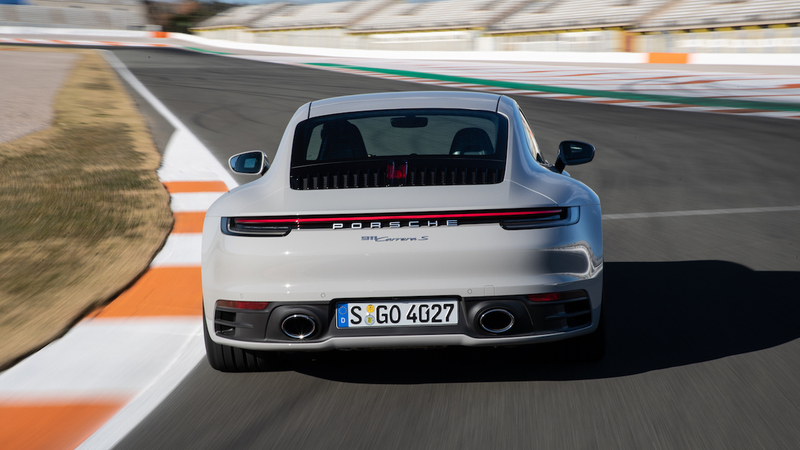 Slightly heavier than the 991.2, owing in part to that hybrid-ready transmission housing, the 992 retains the same predictable chassis responses and crispness at the front axle. Porsche’s sophisticated raft of tech, including actuated anti-roll bars (PDCC), rear axle steering, and performance-tuned active dampers (PASM Sport) all show up here. Find a good road, dial up the Sport setting, drop the hammer, and the 911 attacks and slithers through corners like a pit viper, begging for ever quicker inputs from all limbs, and punching out of corners with railgun-like alacrity. Zero to 60 miles per hour goes by in 3.3 seconds, with launch control making the rear-drive S quicker than a 911 Turbo from less than a decade ago. The latest version of the 3.0-liter twin-turbocharged flat six is up to 443 hp and 390 lb-ft. Improvements include a redesigned intake, slightly larger turbos, with higher boost pressure and a more responsive wastegate, and a new direct-injection system using piezo injectors. 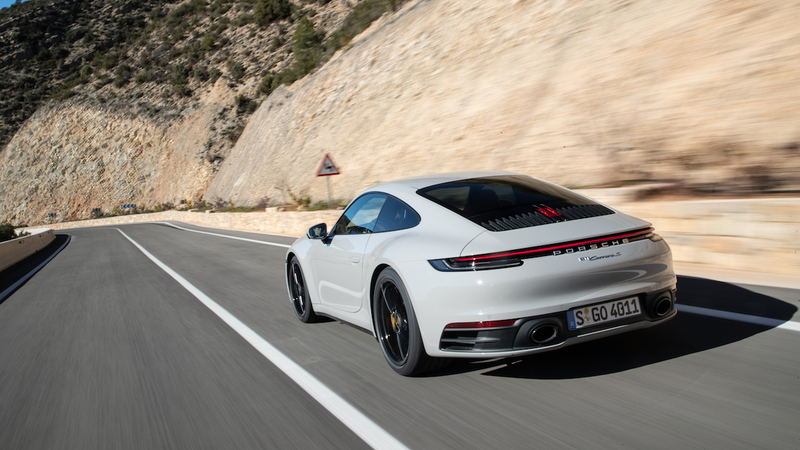 The new tune gives the Carrera S’s higher-spec six a bit of extra snap, while improving efficiency and overall mechanical creaminess. That engine spins up to its 7,500-rpm limiter relentlessly. With a shorter first gear (as well as overdrives in seventh and eighth), I found myself up against the cutoff, at 1,000 rpm past the torque peak, more than once. Human error aside, this new build is another Stuttgart masterpiece. It’s flexible, eager, and quick on the draw, and despite a higher compression ratio, more docile at lower revs, owing to asymmetrical valve actuation on the intake side. Sadly, our gorgeous chalk gray ($3,270) test car, a European model Carrera S, had just two pedals in its footwell. A manual version is coming later in the year (American buyers still buy lots of stick 911s). 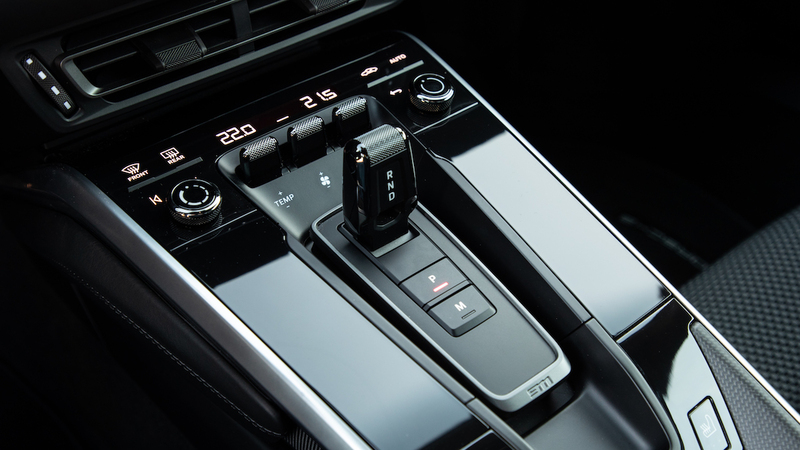 Still, the latest 8-speed PDK is a highly refined instrument, whose automatic mode bangs off up- and downshifts with spooky accuracy. That’s may not impress 911 fans who lament its analog lineage, but a decade on, PDK remains an astounding achievement of hardware, sensors, and software. An overarching theme of latter-day 911s is the continual expansion of their dynamic range. 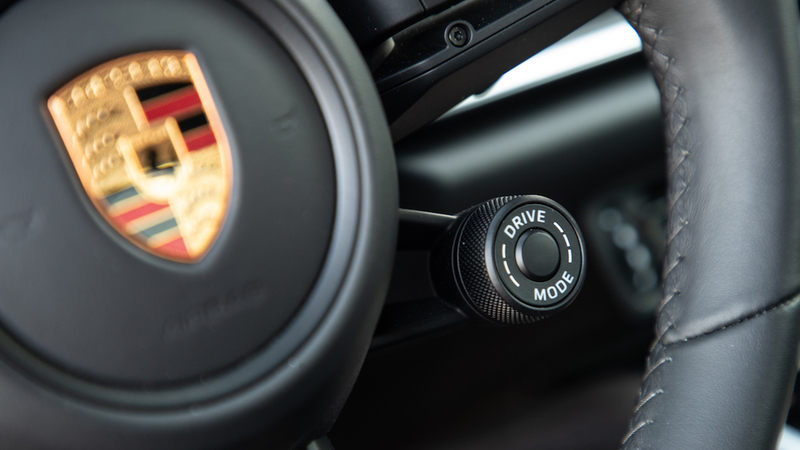 The latest version of Porsche’s PASM active dampers, now with infinitely adjustable valving, continue to push the 911’s chassis in opposite directions simultaneously: more comfort and better high-performance grip. The optional PASM Sport setup, which the test car had, adds higher spring rates, stiffer damper tune, and a 10-millimeters-lower ride height. With the selector in Normal mode, the 911 is more compliant than ever, with the PDK and dampers conspiring to engage in luxury-car cosplay. But hit Sport Plus and hit the track, and the 911 demonstrates why it’s still the best sports car for the price. With a wider track, and 305-width tires over the rear 21-inch rims (staggered, with 20-in units up front), the 992’s grip is ruthless on and off camber. That familiar at-the-hips swivel, better suited to aggressive trail braking than ever, still predominates. It’s a shame so few Carreras will spend time on a circuit, because it’s here the car feels most at home. 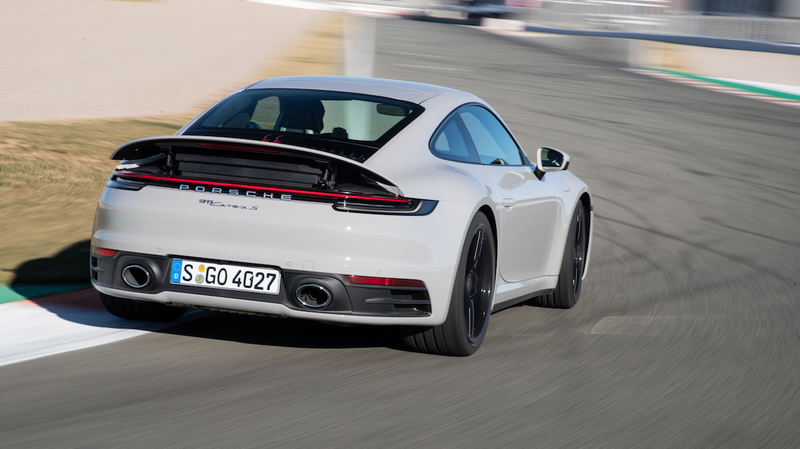 At 3,382 pounds curb weight as tested, the 992 gains around 160 pounds over the 991.2 Carrera S, although the extra power, quicker steering, and chassis tune mitigate the liabilities. 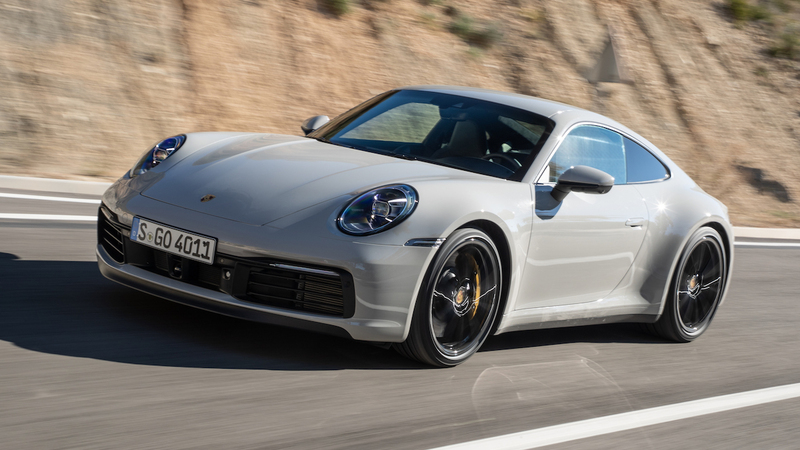 (The 911's body-in-white is actually slightly lighter, owing to more aluminum and less steel, but structural changes related to the upcoming hybrid version bring up the total.) Some new active-aero touches, including continuously adjustable front intakes, and a larger, two-position rear wing, continue to give the 911 a wider range of drag depending on speed, road conditions, and cooling needs. It's not only about performance. A longer list of creature comforts and driver aids, along with a fresh interior treatment with some retro touches, make the new 911 more livable. The new dash binnacle is a gorgeous blend of analog and digital, with configurable TFT screens canted slightly inward to accentuate the cockpit-like feel, and a striking new rev counter sitting dead center. A new thermal imaging function ($2,540), fed by forward-looking optics, can be fed to one of the screens. 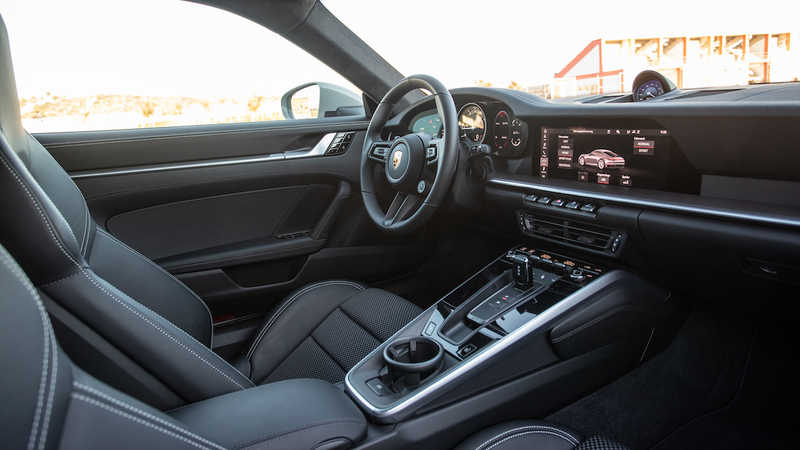 The dashboard line mimics the long horizontal of the original 911’s insides, with a piano-black console replacing standard buttons with a line of rugged toggles. The new PDK selector is a handsome knurled-aluminum piece first seen on the 918 hypercar. A new, quick-acting 10.9-inch touchscreen dominates the central dash like a Jumbotron on a log cabin; a new Surround View driver-aid system shows up here. Let’s get “Wet Mode” out of the way. The new safety system uses acoustic sensors in the wheel wells to predict wet-weather driving. 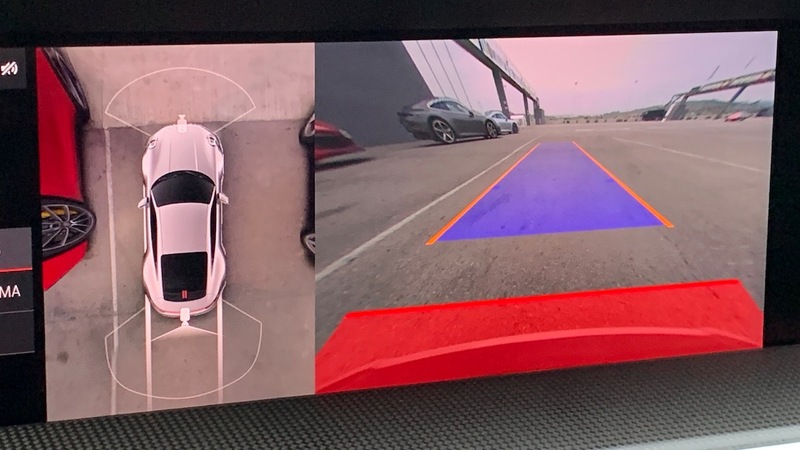 Then, the system suggests the driver manually choose Wet Mode, which sets less aggressive throttle and PDK maps, adjusts ABS, and tweaks stability control thresholds to offer the best control. Adaptive aero goes into full drag mode. The system works well enough, and will likely help some inexperienced drivers stay out of the weeds. It was inevitable we’d get to pricing, which, for the Porsche 911, is like opening Pandora’s Box and finding a genie holding a can of worms in one hand and a kettle of fish in the other. The test car’s base price was $113,000—but the test car totaled $160,850, or $46,300 in options. The most expensive of those included the, albeit phenomenal-sounding, Burmester High-End Surround Sound System, at $5,560 and the essential-for-enthusiasts Sport Package, which includes Sport Chrono (and requisite Sport Plus mode), active suspension, Sport PASM, and sport exhaust, at $5,460. Those actuated anti-roll bars, which require a separate 48-volt circuit, cost $3,170, and the new, more comfortable sport seats cost $3,470. Rear steer adds an extra $2,090, and there's a lot more on the docket to audit. Does that make the Carrera S the most expensive sports car or the least expensive supercar? That’s one for the Internet to debate, and for buyers to decide for themselves. 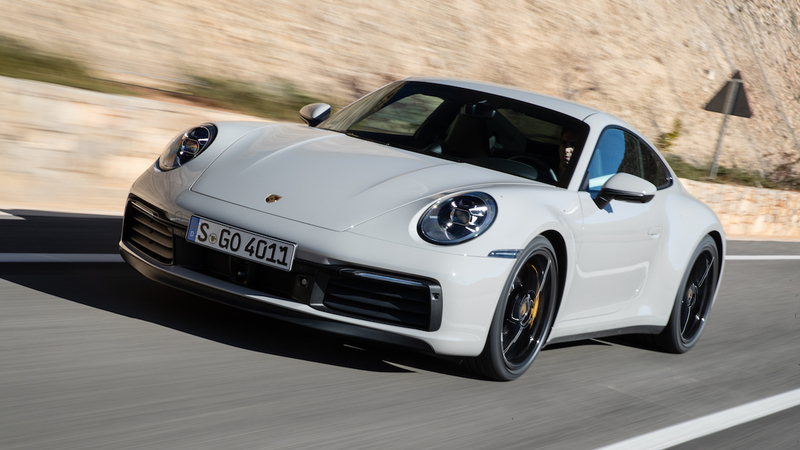 Either way, the new 911 continues to reflect Porsche’s inexorable, and some might say inevitable, march toward the moving target of perfection.